I work from home a couple days a week. At home, I have an iMac 5k and use Microsoft Remote Desktop 10.2.3 on the iMac to remote into my company workstation which is a Windows 10 virtual machine. 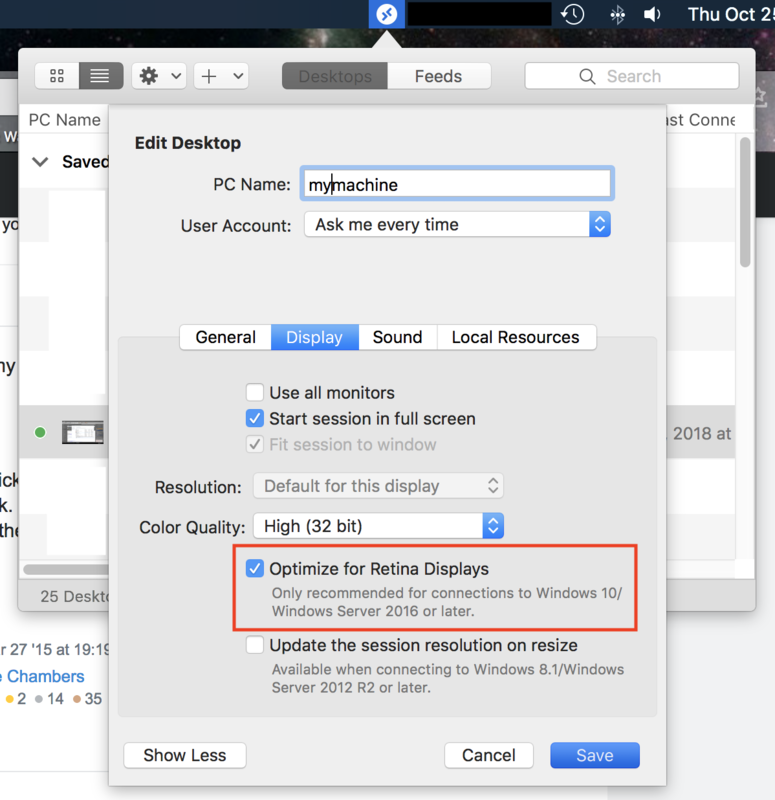 I utilize the "optimize for retina display" setting within microsoft remote desktop. I also commute into the office other days of the week and work off a Windows 10 machine at the office thats set to 1080p (so much lower resolution than the iMac's 5k). Problem: when I remote in from home on my iMac with the above retina setting enabled, the remote Windows 10 machine looks good - it renders in high DPI and text is sharp etc. However when I remote in from my office machine, which is running at 1080p the remote Windows 10 machine looks funky - task bar icons are stretched out, text is fuzzy in Outlook, word, excel etc. I suspect the problem is my initial remote desktop session is optimized for my 5k display, then because I disconnect from my session (rather than logging off) and remote in from my office with the lower 1080p display, the remote Windows machine isn't "downgrading" its resolution to accommodate the 1080p display. The only solution I've found is to log off my session, remote back in (which creates a new session) and then the remote desktop renders better under my native resolution (1080p or 5k depending on where I'm working that day). Browse other questions tagged imac remote-desktop resolution .